Densities (T, ρ data) or PVT data for pure components or defined mixtures are needed for various applications as simple volume to mass flow conversations or the development of accurate equations of state. For mixtures the excess volumes are also of interest and can be derived from accurate density measurements. Therefore, a number of different set-ups are available in our laboratory. 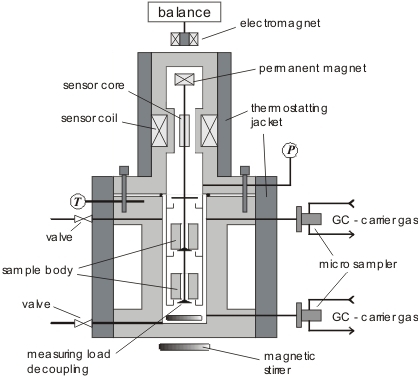 A computer operated apparatus for the measurement of liquid densities of pure compounds and mixtures in a large temperature and pressure range was developed since 1997 by Dr. Ihmels. A high pressure/high temperature vibrating tube densimeter (DMA-HPT prototype from Labor für Meßtechnik Stabinger (Graz, Austria)) is used for the measurement of density and temperature. 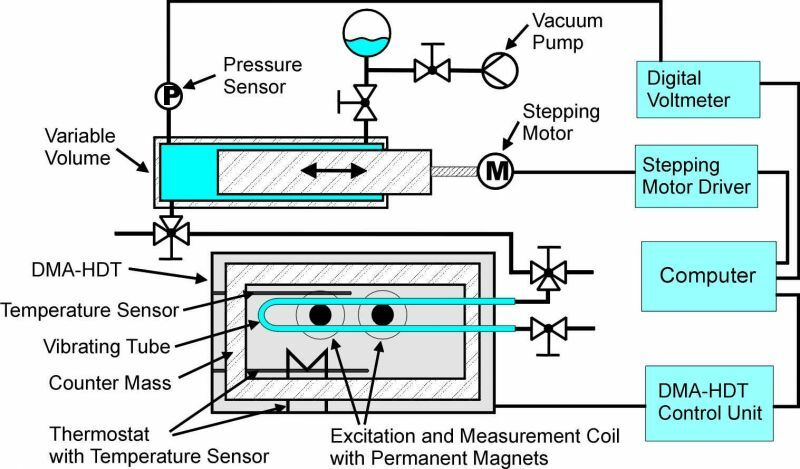 The measuring cell contains an U-tube oscillator (Hastelloy C-276), a thermostat, temperature sensors for control and measurement as well as excitation and measurement coils using permanent magnets. A modified DMA control unit is attached to the measurement cell. The pressure is adjusted with the help of a variable volume connected to a step motor. 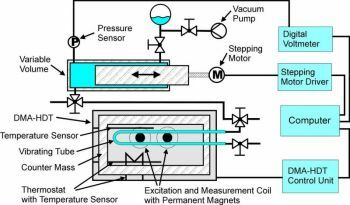 For pressure measurement a sensor is attached to the variable volume. The measurement is controlled with the help of the Windows program "AutoTPX – Density Measurement" (Dr. Christian Ihmels). Automatic temperature and pressure programs for the liquid density measurements of compressed pure compounds and mixtures up to 523 K and 40 MPa are possible. The control program is connected to the pure component data bank of the Dortmund Data Bank (DDB). By using the Antoine equation (parameters from the DDB) each isotherm is started slightly above the saturation pressure.